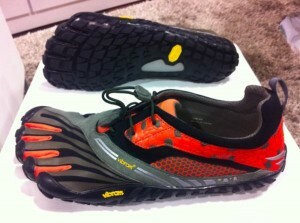 Running Through the Passage: Back to Vibrams? How I can go for a year without worrying so much about my running shoes only to be stuck in this predicament I don't know. Okay, I'll lay out the issue: I was loving my NB 1010s then they started falling apart. I thought they were the answer to my trail running (with a lug-based minimalist sole) but prior to falling apart my NB 1010s had been giving me a significant amount of calf pain which I was trying to figure out but never quite got to the bottom of. So NB1010s back in the box and in with the Asic Kahanas. Nice, grippy shoe that seems like it would be the ultimate winter running shoe (and I'll keep them for next winter's training for sure). The problem? They gave me pretty nasty blisters on each arch which have led to two weeks of hobbling around. I hate blisters and open blisters are the worst (one runner calls them "Pure hell," I agree). At one point the foot with the open arch blister got so swollen I had to adjust my regular minimalist everyday shoes to accommodate my new cankle. Ugh. Even expensive blister patches only went so far in mitigating the foot pain in my Asics. I ran anyway-I know, stupid-but ask any runner in training for an ultra if they would just take off two weeks to recover from blisters, I'm betting most would laugh at the suggestion. So I ran, I even raced, but yesterday the prospect of running another 10k in the Asics seemed like en experiment in running torture. I looked at my options. I had to run on my treadmill (snowstorm) so I knew I could go completely barefoot, wear toe socks or run in my old Vibram Sprints. I decided to try on my VFFs to see how they felt and if they would rub up against my sore arch. I was happy to find they didn't bother my arch at all. So I started my run, walking really for the first mile, no major pain, so I turned it into a run and was happy to see my speed was better than it had been in the past few runs. I finished my 10k happy and surprisingly not sore at all. I expected at least a bit of calf pain because I hadn't been running in VFFs in a few months but there was none. Maybe the NB 1010s were minimal enough that my calves could handle the 10k. Sweet. I felt so good I even considered another 10k run later in the day, but due to family activities it wasn't really possible unless I wanted to sit through a gymnastics class a sweaty mess. I erred on the conservative side and didn't run again. Today though I packed my VFFs for my indoor track run (also a 10k, but at a faster pace). My dilemma is though that I still have a trail ultra to run in 1.5 months and I know the VFF sprints just don't have enough grip for the terrain I'll be running. So I've started looking at Vibram.com to see what new models have come out. To my surprise they've made a trail VFF called the Spiridon LS (named after the first marathon winner in the Olympics). These VFFs certainly look like they've got enough sole to handle what I'll throw at them...now how do I convince my husband I should buy a pair of these after just spending $100 on the Asics?